Over the last several years we've learned that the sharks that entertain us in the summer spend their winters off the Florida coast. We've also seen that they are being tagged with GPS transponders so they can be tracked. Well, now we can follow along via the OCEARCH Global Shark Tracker, where you can observe the navigational pattern of sharks that have been tagged with this satellite tracking technology. If you go to this link from your smartphone, you can install a 'web-app' that'll allow you to track the sharks from anywhere. OCEARCH facilitates unprecedented research by supporting leading researchers and institutions seeking to attain important data on the biology and health of sharks, in conjunction with basic research on shark life history and migration. These last few weeks I've been watching a 3500 pound shark, named Mary Lee, that was originally caught and tagged last September off Chatham. This shark subsequently traveled to Jacksonville, Florida, then north to Nantucket, and now on her way to Bermuda. Another Weekend Storm - Ugh! I don't mean to sound like a complainer, but to only get snowstorms on weekends seems a bit much. Luckily (for the Cape), this coming weekend may be more of a 'rain' event, but we're still slated to get 2-4 inches, compared to the foot-or-so up north. 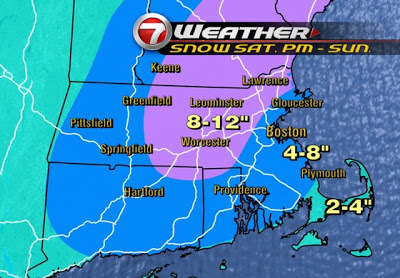 Here is this morning's weather map, courtesy of WHDH.com, Channel 7. The tugboat Hammer's last voyage will likely be to the dump. 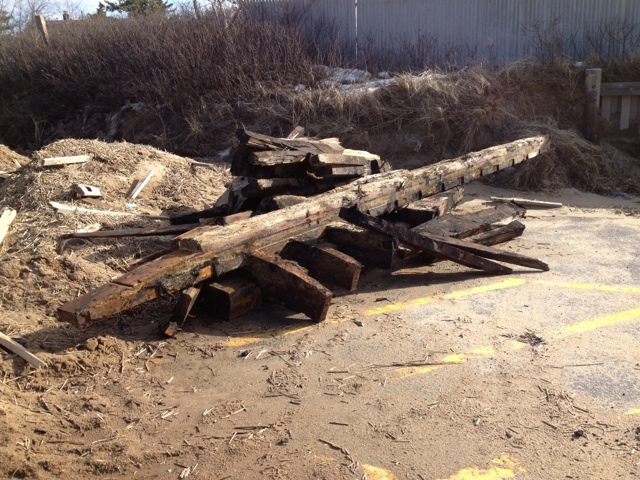 The storm a week or so ago drove the wreck from it's long time resting place up onto Cooks Brook Beach, where it broke up and has since been moved, in pieces, onto the parking lot. Check out its current ugly state. This past week's storms have done significant damage to the protective sandbars leading to Monomoy Island. Here is a video, courtesy of the Cape Cod Times, showing the new break through the sandbar south of Chatham. My March 2013 Newsletter Is Available Now! My March 2013 report is available now! 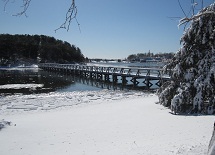 This issue of my newsletter has my 2012 year-end market report for Eastham's neighboring towns. Additionally, you'll see a story about tracking the sharks tagged off Chatham's coast. This newsletter has been published every month for 10 years. My goal, with my newsletter, is to provide accurate sales and market information about the Eastham housing marketplace, to add commentary and opinion (as appropriate), and to keep it interesting. Download your copy of my March newsletter now. 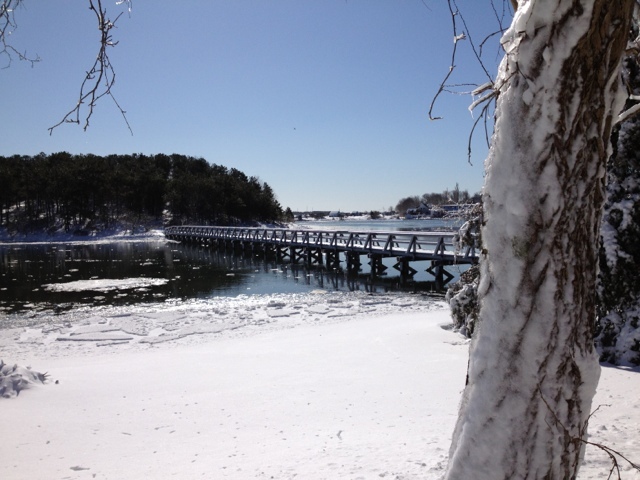 Super high tide and a foot of fresh snow at Wellfleet's Uncle Tim's Bridge. Is It Inches or Feet? 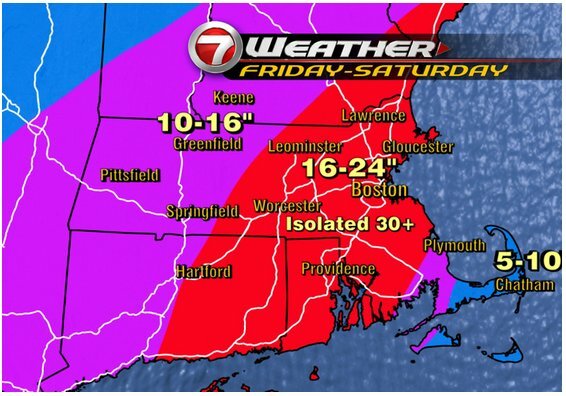 The Cape seems to bring out the worst in weather-persons. Some say we're in for over a foot of snow - others say we're going to get just a little snow, followed by rain and higher temperatures. I guess I can't do any better, but my gut tells me it's somewhere in the middle. The chart below, from WHDH (channel 7) in Boston, shows that we'll get 5"-10" of snow. The weather-persons are comparing the upcoming storm to the big storms of 1978 and 2003, which had snowfalls in excess of 27 inches. The first flakes have fallen and the storm is due here in the late morning. We'll see. Potentially, a Stop & Shop is to be located on the 11 acre parcel where the old T-Time Driving Range has been since the 1960's. Although no plans have been announced, this sale might well be the first step. Hmmm. Read the CapeCodToday.com article ... Here. January's Sales Results - So, So .. The median sale price in January was $392K. There are currently 102 active single family listings in Eastham (up from 96 on January 1st), with an average list price of $600K and a medium price of $447K. The average days-on-market is currently 269 days. For more details, graphs, and commentary, download my latest monthly Eastham newsletter -- here. I've been publishing this newsletter for almost 10 years with the goal of providing market information to my clients, so they may approach the market from a more informed position. Check it out!